A rare and valuable shipment arrived from Cuba today. But it’s not hand-rolled cigars or fine rum. It’s a coral core: A 48 inch column of pure coral, about as long and wide as a baseball bat. The core was collected off the coast of southern Cuba and it’s the first intact, long core ever drilled from a Cuban reef. It contains historical information that could help solve a mystery: Why are Cuban coral reefs so healthy and will they be able to stay that way as the climate changes? Coral growth is affected by seawater conditions like temperature, acidity levels and available nutrients. This makes coral cores ideal “archives” of local environmental change, says Siciliano, because scientists can read past water conditions by analyzing the chemical marks they left on the coral. 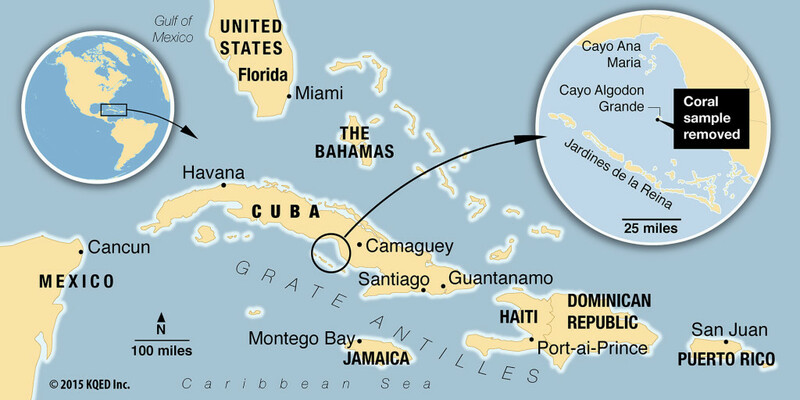 The corals were collected in February of this year off the southern coast of Cuba. This particular core is about four feet in length, which is impressive, but size only matters to Siciliano in terms of time—four feet in length means the core could have coral that’s over two hundred years old. With this data, she and her team will be able to reconstruct the reef environment from the early 1800s to today, and see how the coral’s growth responded to environmental change over that time period. 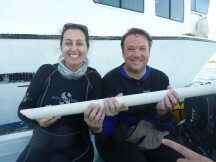 Siciliano, her Cuban counterpart, Patricia Gonzales of the Center for Marine Research at the University of Havana, and Konrad Hughen of the Woods Hole Oceanographic Institute, hope to use this data to determine what historical factors have made the Cuban reefs more robust than other reefs in the region. They're especially interested in how the corals responded to changes in runoff from agriculture. When the U.S.S.R collapsed, Cuban farmers were cut off from synthetic nitrogen fertilizers and the Cuban government decided to transition the nation to organic farming methods, which still dominate today. This meant a reduction in the amount of synthetic nitrogen chemicals washing from farms to the reef. Corals are animals so they need nitrogen, an essential nutrient, to survive. But too much can disturb the reef’s natural balance, speeding up growth of algae that compete with coral for space. Does organic farming mean healthier reefs? Siciliano and Gonzalez believe Cuban organic farming practices generate less harmful runoff, and this has translated into healthy reefs. Chemical analysis of the coral core will reveal the truth. These new insights will help scientists and farmers understand the effects of land management, in particular the transition from industrial fertilizers to organic agriculture, on Cuban coral reef waters, Siciliano says. They will also use the two hundred years of environmental data to reconstruct how local and regional climate change has affected coral growth. That information will help them understand not just how Cuban corals fared in the past, but how they might survive in a warmer, more acidic, ocean. Carbon dioxide in the atmosphere affects reefs and other marine communities in two ways: it traps heat in the air, which heats up the water, and it reacts with seawater to create an acid, lowering the water’s pH. Warmer waters are stressful for corals, and if the temperature stays too high for too long, corals will “bleach”: expel the tiny, photosynthetic algae that normally live in corals and are responsible for their brilliant colors. Bleached reefs appear white and barren, and in the case of hard or “stony” corals what’s left behind is their calcium carbonate structure. Calcium carbonate is the same hard mineral that clam shells and chalk are made of and it’s vulnerable to the second effect of carbon dioxide: ocean acidification. Hard corals, like the Siderastrea the Cuban core was drilled from, need calcium and carbonate ions in the waters around them to build their structures. When the ocean absorbs carbon dioxide, the gas reacts in seawater to make carbonate ions less available. It’s harder for corals to grow and it creates acidic conditions that can dissolve calcium carbonate corals have already built. Coral reef scientists like Siciliano know this double-whammy of warmer and more acidic waters could be disastrous for the world’s coral. 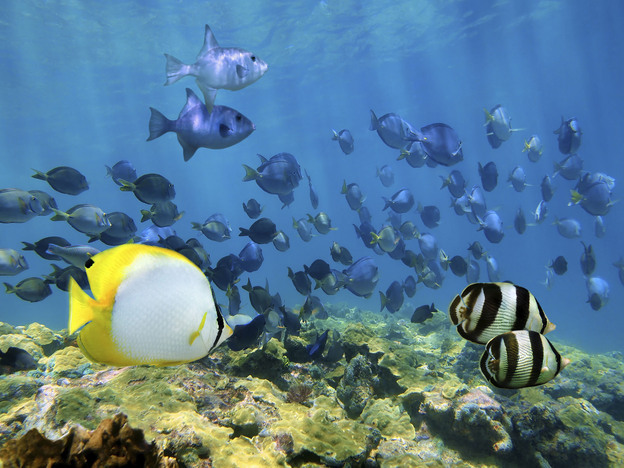 But individual reefs, like those in Cuba, have weathered local changes in temperature and acidity before. The core will tell them how Cuban corals responded to this past climate change, and how "sturdy" they could be in the face of today's rapidly changing climate, Siciliano says. "The pace of climate change today is unprecedented," she says. "Corals in other parts of the world that aren't as healthy, they just can't keep up." But Siciliano thinks Cuban corals might be strong enough to have a good shot at surviving these rapid environmental changes and looking to what happened in the past will test this hypothesis. What happened to the corals when waters got warmer and more acidic before? Did their growth rate change? Was the strength of their calcium carbonate structure compromised? The answers to these questions, and the story of this coral's past, will provide clues to the future of reefs not just in Cuba, but around the world.